As you might imagine, we have a lot of football on our schedule this weekend. But before we get to the coast-to-coast gridiron action, let’s start in Los Angeles with a very special event that we’re proud to be a part of. It’s time to Stand Up to Cancer once again, and PSSI Global Services has assembled some of our finest at Santa Monica Airport’s Barker Hangar to provide extensive transmission services for this important event. Engineers Brian Blomstrom, Wes Hill and Chris Hovden have been setting up the CK35 mobile teleport in preparation for Friday night’s broadcast, which will air on all major networks, Facebook, YouTube and Twitter. Project managers David Gallardo and Logan Schinto are also on-site to ensure that everyone receives a clean signal for worldwide distribution. Our team is encoding multiple fiber paths in addition to C-band and Ku-band satellite transmissions. Co-Executive Producer Bradley Cooper will host the event with appearances from Jason Bateman, Jennifer Garner, Kathy Bates, John Hamm, Keanu Reeves, Kaley Cuoco, Mahershala Ali and Katie Couric, with simulcasting from Canada’s Stand Up to Cancer! Before we get into game day Saturday, let’s start with the NFL kickoff on Thursday night. PSSI News Group’s Scott Garber was there at Lincoln Financial Field in Philadelphia, Pennsylvania, for CNN’s coverage of the big game and all the hoopla (and controversy) that only the NFL can generate. The Eagles hung on to beat the Atlanta Falcons, kicking off what will surely be an exciting season. Also on Thursday night, we had a game full of a bunch of kids who hope to playing for the NFL one day. David Meyer and K20 were at Terry Ennis Stadium at Archbishop Murphy High School in Everett, Washington, on Thursday for high school football when the Hockinson Hawks faced the Archbishop Murphy Wildcats. Dennis Smith has a little high school action, as well. He’s at James Weir Stadium at Belle Vernon High School near Pittsburgh, Pennsylvania, on Friday when the Thomas Jefferson Jaguars face the Belle Vernon Leopards. Rick Varney in the C42 and Mike Howley in the C32 are both at Michigan Stadium in Ann Arbor on Saturday when the Western Michigan University Broncos face the Michigan Wolverines. It’s yet another 4K broadcast for Mr. Varney, as he and Mike will both be putting up a 4K/HD mux for our friends at Fox for the 4K game of the week. After the high school game, Dennis and the Arizona truck head to Mountaineer Field at Milan Puskar Stadium in Morgantown, West Virginia, when the Youngstown State Penguins face the West Virginia Mountaineers. Steve Toth and Abisai Falcon will be at Williams-Brice Stadium in Columbia, South Carolina, when the Georgia Bulldogs take on the South Carolina Gamecocks. This is the SEC on CBS game of the week, and it’s sure to be a barn burner. Benny Griffis and the C24 will be at Navy-Marine Corps Memorial Stadium in Annapolis, Maryland, when the Memphis Tigers face the Navy Midshipmen. We’ll be back in Annapolis next week for CBS Sports Network, and we’ll be there for every home Navy game all season. Mike Lemieux and C41 will be at Michie Stadium in West Point, New York, when the Liberty Flames take on the Army Black Knights. We’ll be there again next week, too! John May and CK48 will be at Memorial Stadium at University of Oklahoma in Norman when the UCLA Bruins face the Oklahoma Sooners. Todd Harvey and C49 will be at U.S. Bank Stadium in Minneapolis, Minnesota, when the Fresno State Bulldogs face the Minnesota Golden Gophers. Mike Sheehan in C43 and Rick Kolinek in K22 will both be at Kinnick Stadium at the University of Iowa in Iowa City when the Iowa State Cyclones face the Iowa Hawkeyes. Marty Smitherman and K38 head to the FAU Soccer Stadium in Boca Raton, Florida, when the Air Force Falcons face the Florida Atlantic Owls. Rick Ball, Steve Chaisson, Dave Brin, and the Atlas and C47 trucks will all be at Stanford Stadium in Stanford, California, on Saturday when the USC Trojans take on the Stanford Cardinals. Project manager (and USC alum) Eric Storlie will join them, as well, to provide some driving support and a little extra enthusiasm for our team in Stanford. And we keep on rolling into next week with more football action. John Bright’s back on the West Coast to run our K34 production/uplink truck. He and Nathan Holsey are headed to Jack London Square in Oakland, California, to set up for ESPN’s Monday Night Countdown. Our guys will be providing extensive production and transmission services. Then from Oakland we head to Vegas for the boxing pay-per-view (PPV) of the year: Canelo versus GGG on Sept. 15. Look for more on that HUGE event in next week’s roundup. Before that fight, we’ve got a lot of boxing and MMA on our plates this weekend. Let’s start on the east coast, where Mati Kerpen’s back at Barclays Center in Brooklyn for Showtime Boxing. Shawn Porter faces Danny Garcia for the vacant WBC welterweight title in 12 rounds. 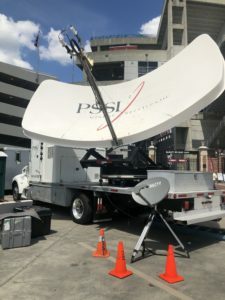 Speaking of Showtime, PSSI International Teleport (PIT) took the reigns on transmitting the network’s prime-time programming Thursday night in disaster recovery mode as severe storms hit Showtime’s broadcast facility in New York. Showtime viewers had no clue of the switch over to PIT thanks to the seamless design and protocols developed by the engineers between the two facilities. Great job by all involved! Back to boxing, this time on the West Coast. We’ve got a big group of trucks and engineers at the Fabulous Forum in Inglewood, California, for HBO Boxing. Engineer in charge (EIC) Paul Blomstrom and senior project manager Eric Hall are leading the charge for HBO’s domestic broadcast of Boxing After Dark on Saturday night, which we are transmitting via fiber and satellite. Larry Sheets is in one of newly upgraded Ku-band trucks, the NT25, for the satellite portion of the domestic broadcast. It’s Estrada versus Orucuta in the main event, and boxing fans in the U.S. aren’t the only ones who are interested. Project manager Tommy Lopez is also on hand with engineer John Jennings for the international feed, while Robert Sanchez and Oscar Zapata handle ringside duties for an Argentinian broadcaster. Wes Hill and Chris Hovden will round out our lineup in the CK35 mobile teleport — all three fresh off the Stand Up 2 Cancer event on Friday night — for dual-antenna transmission of a Mexican broadcaster’s unilateral production of the fight. Big show! Maybe even bigger is UFC 228 at the American Airlines Center in Dallas, Texas, on Saturday night. 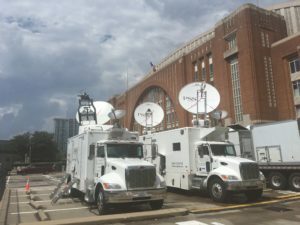 EIC Tracy Michaels and project manager Garrett Hunt have been prepping the PPV transmission plans with our friends and partners at Concom for weeks, and now our team has converged in Dallas to begin testing for the main event on Saturday night. UFC veteran Jim Flowers is at the helm of the newly upgraded CK25 mobile teleport, while road warrior Chris Golden “takes a break” from nonstop Golf Channel action to join our PPV team for the big show. 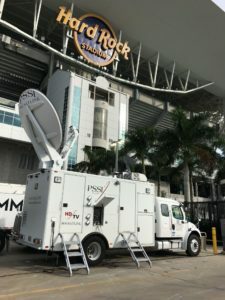 Ron Ford’s bringing his K26 truck to the site as the emergency backup path, while Mark Huss is in town to provide ringside audio services for BBC Radio’s broadcast of the event. The headliner is Tyron Woodley versus Darren Till, but before they square off there will be hours of exciting and brutal fighting for MMA fans here in the States and around the world. Oh yeah, there’s still more football on the schedule: soccer! We are thrilled to be working with our colleagues at Arqiva to provide the domestic origination for a series of international soccer friendlies here in the U.S. Marty Smitherman and John Jennings kick things off for this package on Friday night. Marty’s in Miami Gardens, Florida, at the Hard Rock Stadium where Colombia takes on Venezuela. Then, out west, John is at the LA Coliseum for Guatemala versus Argentina. Should be some high-level action on both coasts Friday night! We’ve got some more international flavor on our docket this weekend. Dave Buckman’s going to be dressed to the nines in Manhattan this weekend for the launch of Hugo Boss’s Fall/Winter line at New York Fashion Week. Dave’s signal will be turned to fashion fans in Italy who are excited to see what Hugo Boss has in store for the fashion world this winter. And, of course, we have some golf and racing, as we do pretty much every week of the year. Kevin Spangler’s making his way to the American Legends for Mountain Mission Kids at The Olde Farm golf club in Bristol, Virginia, for a two-camera live shot on Golf Channel’s Morning Drive early Monday morning. 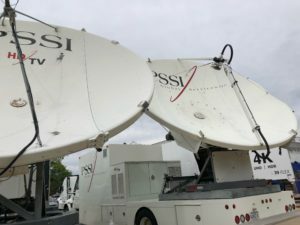 Blake Blomstrom’s rounding out a solid week of multipath transmission and comms services for Golf Chanel’s coverage of the BMW Championship at Aronimink Golf Club in Newtown Square, Pennsylvania. American Xander Schauffele is atop the leaderboard as of this writing, but it’s anyone’s tournament as NBC picks up live coverage from the beautiful course outside Philadelphia. And then we’re racing. The C27 mobile teleport is at the Indianapolis Motor Speedway through Sunday for a series of races that will culminate in Sunday’s Brickyard 400, the final race before the NASCAR playoffs. Kyle Meyer and Jonathan Ayala are providing extensive satellite and fiber transmission services along with our partners at AT&T Global Video Services. Next week, we’re rolling to Vegas! Florida-based Justin Roszak is a long way from home this weekend at the WeatherTech Raceway Laguna Seca in Salinas, California, for the second-to-last IMSA race of the season. Justin’s had an amazing run as the primary transmission engineer for NASCAR’s 28-path at-home production. With guidance from senior engineer Rick Ball, Justin has provided weeks of flawless engineering with an unprecedented amount of data transmitted over satellite. That rounds out our weekend, but we are well underway as we prepare for next week’s action across the country (and beyond). With another full load of football, a huge PPV and some international events, our operations, logistics and maintenance staff members are working feverishly to ensure each and every truck and engineer is in place for what will be one of our busiest weeks ever. PSSI Global Services is keeping up the pace like no other!